Didn’t mean for this to end up being my great American novel. It’s a long story!! Just happened to be my day off. Back in those days, we had rotating days off at the Post Office. It was a Thursday, the Thursday after Labor Day weekend – must have been 1998? – and it was my Thursday to be off. Sitting at my computer, hair loose & wet from a shower, I heard a vehicle coming up our long, gravel driveway. Got up, peered out the window. A Sheriff’s Deputy was approaching the house. My eldest son, Jesse, had left for work not very long before, so immediately my thoughts turned to the worst. I opened the door and stepped outside, with much trepidation, to greet the Deputy. “I have a warrant for a Robert …” then he stumbled over and badly mangled my last name. “No Roberts here.” “Can I see your ID?” “Sure.” I went to fetch my wallet and pulled out my driver’s license, handing it over to him. The Deputy studied it for a moment, then handed it back. “Well, I guess this is a bad warrant. Have a nice day.” Back to my PC I went, relieved that it had nothing to do with my son. Maybe 45 minutes later, I heard the sound of tires on gravel once again. “Jeez Louise!” It was the Deputy’s car again. My house sat in the middle of 16 acres. Our front pasture bordered the road and a neighbor’s house sat across from it, also with a sizeable pasture. The neighbor had watched the Deputy come and go the first time, leaving empty-handed. The gentleman – I’ll call him “Mr. Neighborly” – jumped in his car and chased down the Deputy, returning to the Court House to get a new warrant issued. This time, in MY name. So, the Deputy comes up to the house. I once again greet him. The plan was to take the family out for a hike on Table Rock Mountain on Labor Day. Our dog, a border collie mix, decided it was time to go into heat. So, the night before the hike, our house was under siege by every male dog [aren’t we all] in the neighborhood. There was an all-night ruckus going on right outside my bedroom window … dogs snarling, barking, huffing & puffing, as they jockeyed for male supremacy, and, I guess, first dibs. It all sounded quite lively and downright vicious, and had a very detrimental effect on my sleep turning me into a snarling, barking, huffing and puffing sleep-deprived grump in the morning. Hike canceled! My now estranged wife – I have an estranged wife; she only has a very STRANGE husband – decided to go out and get a take-out breakfast as a little make-up treat for the kids, some of who accompanied her. They slipped out the back door to avoid the restless pack out front, hopped in the van, and drove off. Upon their return, the van was surrounded by the yapping crowd of dogs. 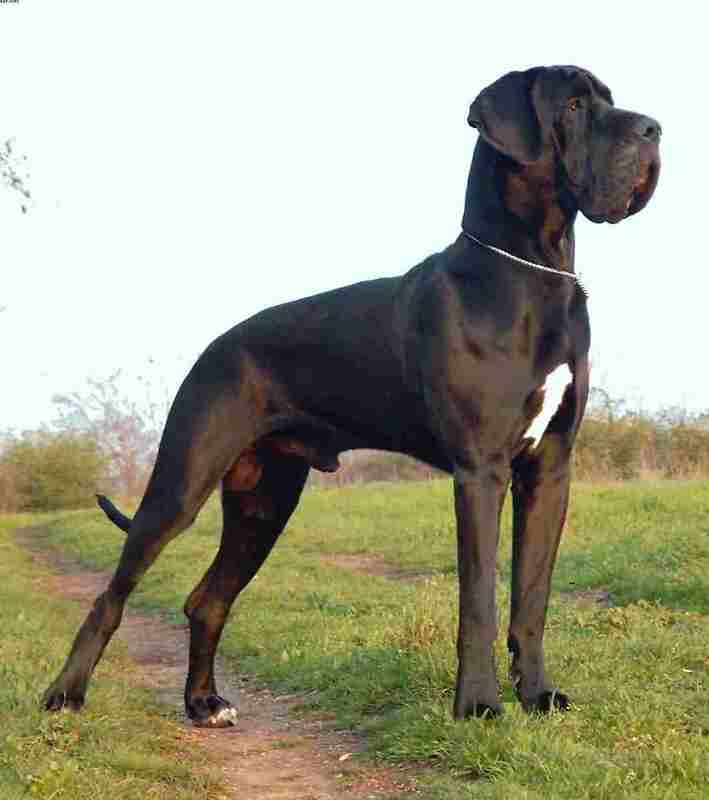 The sliding side door of the van was opened, and a huge black Great Dane attempted entry. The dogs were pretty much in a frenzy. Wife & kids escaped through the front and made it safely back in the house. I asked my son, Adam, to see if he could disperse the pack who had now re-gathered out front. His novel approach to that task was to take a folding chair and catapult it off the front porch into the midst of these barbarian hordes. It actually worked. All dogs took off for cover and disappeared, except for that huge black Great Dane, who just so happened to belong to that neighbor across the road, Mr. Neighborly. This little fella was known to run rampant on our property and on this very day was seen with one of our chickens hanging dead from his gapping mouth. During all this time, dour old me was laying on the couch with a major headache. Not once during any of these events of the morning did I step outside of the house. The Great Dane was insistent that he was staying put. “Just do whatever you can to get him to go,” I said to no one in particular. My son, Chris, then 12 years old, retrieved his Daisy BB gun and went to face the enemy. From the top of the porch steps he fired a BB down at the pooch’s feet. He backed down the front walk to the driveway, more afraid of the sound than anything else. It should be noted here that because of a line of tall evergreen trees it is impossible to see these events from the road. Chris followed the Great Dane sort of shooing him along until he was out in the pasture in full view of the road and the house he lives in just across it. At a distance of at least 100 feet, Chris fired another shot in his direction and he scampered off toward home. That was the last we saw of him that day, though he was back, rambunctious as always, within a day or two. But, for all intents and purposes, that was that. It was over. No harm, no foul. We never gave it another thought. Sheriff’s car pulls up to the court House and takes me in to see the Magistrate. She looked over the charge; I reaffirmed my innocence. She responded that I would have to be held — in jail — unless I came up with $500 bond. I was incensed. Well dang! Who knew the Post Office held so much sway? I had POWER! So, I made it to my court date, after a couple of continuances. One was a kicker. The guy accusing me was right there in the court room, yet, the Judge postponed it because of “failure to appear,” or something. I was told, because he didn’t answer to his name, he wasn’t there. I saw him. Sitting right there! At this point, I knew I was in for hell and that something was not right. What the heck just happened? So, Mr. Neighborly across the street, not satisfied with that result, decided – even though he was absolutely sure that he personally saw me shoot his dog – was going to press charges against Chris. To say I was teed off is a gross understatement. Before charges could be officially levied against my 12 year old, we had to endure an interview with some guy, name and title escapes me, to see if there was reason enough to proceed. Kind of like a Grand Jury – only just him. He had something to do with the schools – a mix between a guidance counselor, truant officer, and parole officer – I don’t know what he was. But, off we went one night for our interrogation. It was at Pleasant Gardens Elementary School, I believe [PG being a part of Marion] and lasted a couple of hours. I made the case that Christopher was an A student, active in sports, had no disciplinary history. I told him that he was only trying to protect his family and following my “orders” – things that should be complimented not punished – and that he had no desire to hurt the dog, nor did he. It was only a case of a young boy trying to find a way to shoo a huge, agitated animal off his property. What if, when the dog attempted entry to the side of the van, he had bitten my youngest child in the face? All for naught. I think we were just going through the motions; that his decision was already made before we walked in — I told you, something wasn’t right. “I find that there is reason to proceed.” Proceed we did. I wasn’t going to mess around this time. Now it wasn’t me, it was my son, and I did feel somewhat guilty for the actions of my lawyer in putting him on the stand. I asked around, “Who is the best lawyer in town?” Pretty much everyone responded with the same name, now deceased. In my limited experience in the McDowell County Courts, it was my observation that most of the lawyers were merely paper pushers. This guy was like a real trial lawyer. He dug up case law, interviewed thoroughly, and had a plan. He was actually going to present a defense. I felt that we were prepared. Still, I was VERY nervous. I had to sit in the courtroom and watch my son go through this. Poor Christopher. Court date finally came. Mr. Neighborly was, strangely, sitting off to the left in a partitioned section of the Courtroom — WITH the Deputies. As I have said, something was amiss. I was called to testify … and testy I did become! I was appalled that there was no transcript from MY trial, because Mr. Neighborly had, during his time on the stand, contradicted that testimony several times. He claimed a van never went out or in the driveway, that he was on the phone talking and looking out the window the entire time. 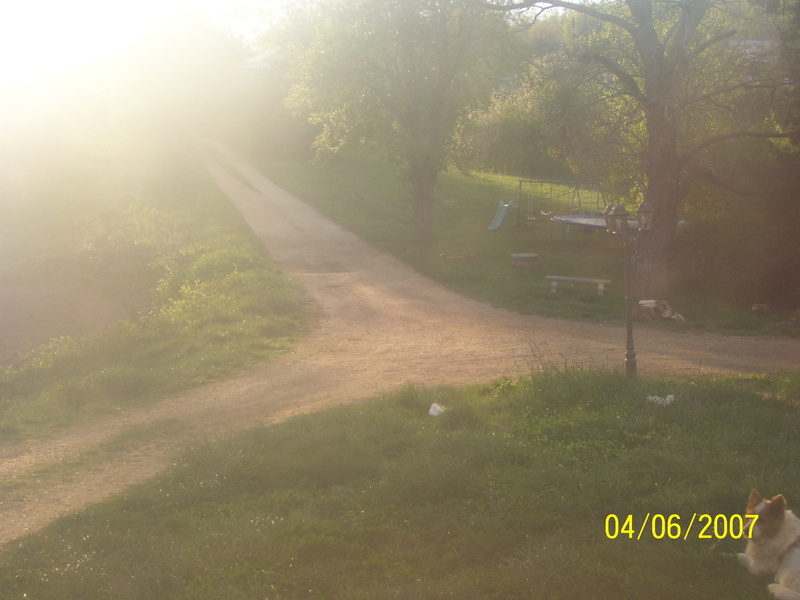 He claimed he could see Chris … not me … shoot from the porch [not possible], he changed the distance and so on. Our lawyer did ask him if there was any way he could have confused Chris for me [referring to the first trial]. While I was up there, the Judge had to tell me to behave, because I bluntly called the man a liar. Photos of a little puppy Great Dane were presented – how cute; so was one of our dead chicken. Our lawyer presented case precedents. Now, it was time for closing arguments. My rear end must have flown about 3 feet up in the air. This, was finally over! Years later, the scene of the “crime” – Poor old Lassie can be seen, lower right, near the date stamp. We all felt a great sense of relief. After hugs and thanks, I went to the office where one can file a false arrest counter suit. The clerk was getting me the papers, when who should walk by but, Mr. Neighborly. POP! I lost it. Got right in his face and ran up one side of him and down the other. All the pent up frustration just poured out. So did all the employees in the building it was so loud. We were pulled apart, and I remember someone saying to me in my ear, “You’re going to get yourself arrested.” Talk about creating your very own “Ground Hog Day”!. What a mess that would have been. Anger & frustration released, I decided that we had won – twice – and the satisfaction of that would suffice. No counter suit filed. Now, it WAS over!! CASE DISMISSED! If only we had just gone to Table Rock! But, I have to wonder, where DID those X-Rays come from? NOTE 1 – Prior to these incidents, there was no animosity of any kind – that I was aware of – between Mr. Neighborly & my family. In fact, I thought he was a good guy! NOTE 2 – Justice prevailed. Due to the several anomalies recorded above, I had serious doubts that it would. I was getting the feeling that Mr. Neighborly & at least some law enforcement and/or court officials were cohorts. The results were even more rewarding because of that! Note 3 – The story is recounted to the best of my recollection. Christopher, being younger & sharper, may be able to provide more detail and correct any that I reported incorrectly. Next Post: Gatherings for the Ages!